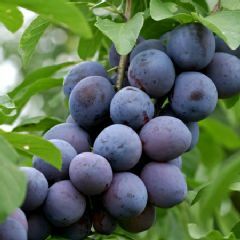 A deciduous, culinary fruit tree that produces sweet, medium-sized, purple plums with yellow flesh that are ready to eat in August. It is a reliable cropper and resistant to frost. Self fertile.